Only a year after its initial launch, the mighty F-150 SVT Raptor is getting its first major makeover, one of which includes the new Raptor SuperCrew cab option. A new integrated 4.2-inch LCD screen mounted in the dash is also fitted to the 2011 F-150 Raptor. Also, the previously optional 6.2-liter V8 engine, which produces 411 horsepower and 434 lb.-ft. of torque, now comes standard for 2011. "When we launched the F-150 SVT Raptor, consumers were blown away with the capability of the vehicle," said Jost Capito, director of global performance vehicles and motorsports business development. "By adding the SuperCrew, we have expanded the versatility of Raptor, and now even more enthusiasts will be able to experience the no-compromise off-road performance that only Raptor delivers." The F-150 SVT Raptor is the first-ever high-speed off-road performance truck offered by any manufacturer and highlights 33 years of Ford truck sales leadership by emphasizing F-150�s Built Ford Tough durability, innovation and engineering. Developed with the DNA of an off-road pre-runner, comprehensive modifications focused on chassis and suspension enhancements. 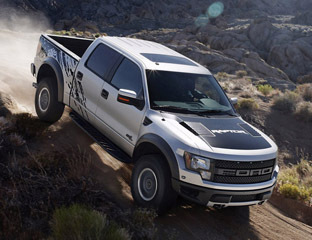 The F-150 SVT Raptor is 7 inches wider than a base F-150 to make room for the additional suspension components that give Raptor its unparalleled off-road abilities. The wider stance also gives the truck an aggressive appearance. 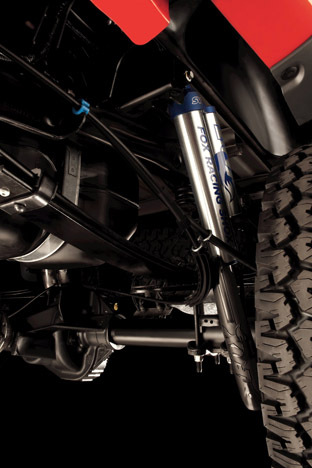 Internal triple-bypass shocks by FOX Racing Shox � the first on a production truck � provide position-sensitive damping and extra suspension travel for extreme off-roading and a smooth ride on the road. Raptor also has unique cast-aluminum front control arms and SVT-tuned 35-inch BFGoodrich� All-Terrain TA/KO 315/70-17 tires. These components give Raptor 11.2 inches of front suspension travel and 12.1 inches of rear suspension travel on either SuperCab or the new SuperCrew. The new available 145-inch-wheelbase SuperCrew offering with a 5.5-foot box adds to the extensive list of F-150 SVT Raptor features. While contributing additional space and flexibility for the customer, the SuperCrew delivers performance as well. Applying lessons learned from the SuperCab F-150 SVT Raptor, engineers were able to tune the truck to handle off-road events with ease. The 12-inch-longer wheelbase on SuperCrew also delivers the benefit of a more comfortable ride, especially in rough off-road situations. "We spent a lot of time getting the ride and suspension characteristics of the SuperCrew similar to that of the SuperCab, and we were successful in getting the same character and flavor out of the SuperCrew," said Jamal Hameedi, SVT chief nameplate engineer. "While the SuperCab and SuperCrew both have different strengths, each is worthy of the Raptor nameplate." 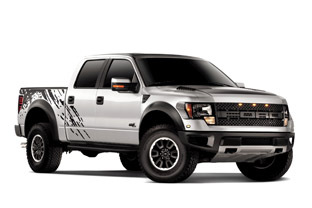 A larger 36-gallon fuel tank and increased towing capability � rated at 8,000 pounds � keep F-150 SVT Raptor SuperCrew a mainstay in the desert environment, with capabilities as a chase or tow truck. 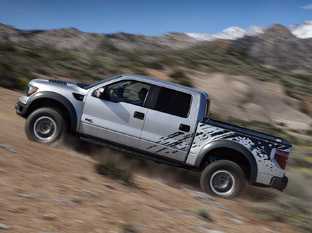 The previously optional 6.2-liter V8 engine, which produces 411 horsepower and 434 lb.-ft. of torque, will now be the standard engine for the 2011 F-150 SVT Raptor, the most powerful half-ton pickup on the market. The Ford powertrain team performed extensive testing to ensure the engine would live up to the Built Ford Tough promise. Hundreds of additional tests beyond the normal verification of truck engines, as well as vehicle testing on a 62-mile durability loop in the desert that simulates the Baja 1000, validated the performance of the engine for reliability and longevity in the harshest conditions. 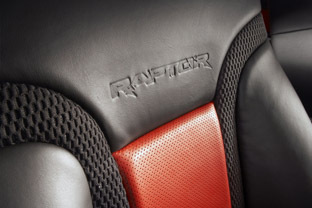 Raptor�s exterior also receives some new touches for 2011, in the form of an additional paint color - Ingot Silver Metallic - that will be available with the standard black interior, or the optional Molten Orange Interior Accent Package. 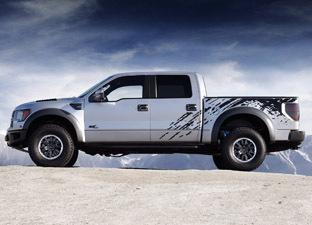 A new optional hood graphic adds a personalized and functional touch to F-150 SVT Raptor. 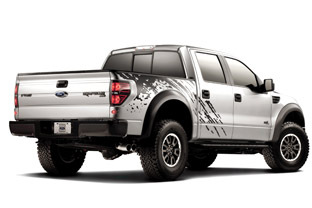 Inspired by older off-road racing Ford Broncos, matte black accent graphics � including the F-150 SVT Raptor logo � run along the hood, also helping to reduce glare. The Raptor logo in the graphic is done in body-color bleed-through, similar to "SVT" on the side vent. 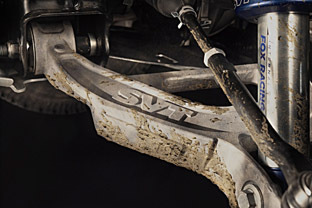 "F-150" and "SVT" are written in dark gray. The graphic is available with or without the box side graphics. Key to helping customers take advantage of all the capability offered by the F-150 SVT Raptor is a standard 4.2-inch LCD (liquid crystal display) productivity screen that is integrated in the center of the new instrument gauges, which have a black face, red pointers and ice blue daytime lighting. 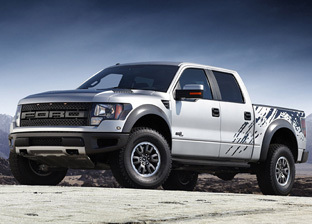 Also used on the all-new 2011 Super Duty, the technology was specifically tailored for off-road use with Raptor. The screen includes a unique welcome animation and offers menu options giving the customer important information related to off-road and towing performance. A truck application screen provides vehicle status information for important off-road parameters such as off-road mode, Hill Descent Control, electronic locking differential settings and AdvanceTrac with RSC (Roll Stability Control). An off-road screen informs the customer about steering wheel angle and vehicle angle on a grade during off-road maneuvers. The menu is navigated through a five-way button on the steering wheel and is positioned between the tachometer and speedometer. "The productivity screen is a great solution for our off-road customers," said Hameedi. "With one glance, they can tell exactly what settings are enabled on their truck and what the driveline is doing." For the customer who wants more control of transmission gear selection, SelectShift Automatic transmission functionality also is introduced on Raptor. 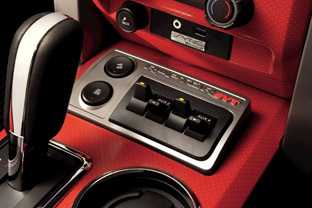 A toggle switch located on the console shift lever engages the mode, where the transmission doesn�t second-guess the driver, giving him or her total control over gear selection and performance feel. Upshifts, for instance, are not commanded at redline, and downshifts are allowed at the lowest gear possible as defined by the engine speed. 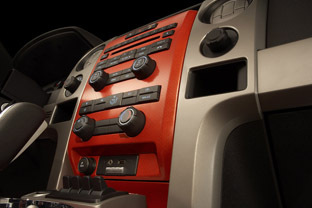 A Raptor Plus Package debuts for 2011, offering the rear view camera and trailer brake controller. The Raptor Luxury Package also receives additional features, with folding power exterior mirrors and Remote Start System with integrated key fob added to the list.